NAMM 2018: There have been surprisingly few wireless keytar-style MIDI controllers, so hats-off to Alesis for delivering a second version of its Vortex model. This promises an enhanced control layout and superior playability in comparison to its predecessor, and comes in a gloss black housing. The wireless connection is achieved using a USB dongle rather than Bluetooth; this can be used with your PC or Mac. Features include 37 velocity-sensitive keys with aftertouch, eight RGB backlit velocity-sensitive trigger pads and eight backlit faders. You also get a tilt sensor and touchstrip, both of which are MIDI-assignable. As you’d expect, the Vortex 2 can be battery-powered and comes with a strap and cable harness so that you can get on your feet right away. You can assign controls using the supplied software editor and a bundle of software is included. The Vortex 2 will be released in the first quarter of 2018 priced at $299. 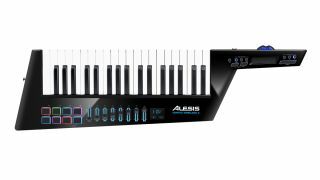 Find out more on the Alesis website.